I have decided to repost these for anyone who missed them the first time around. Sign up to follow me to ensure that you don’t miss out on any of my future posts, giveaways, or previews of my new books. As you can see from the title of this post, I am going to be doing a series of articles about the locations used to film Pride & Prejudice. Not only the 1995 TV series, but also the 2005 film, Lost in Austen and Death Comes to Pemberley. Where possible, I will also add some comparison picture. 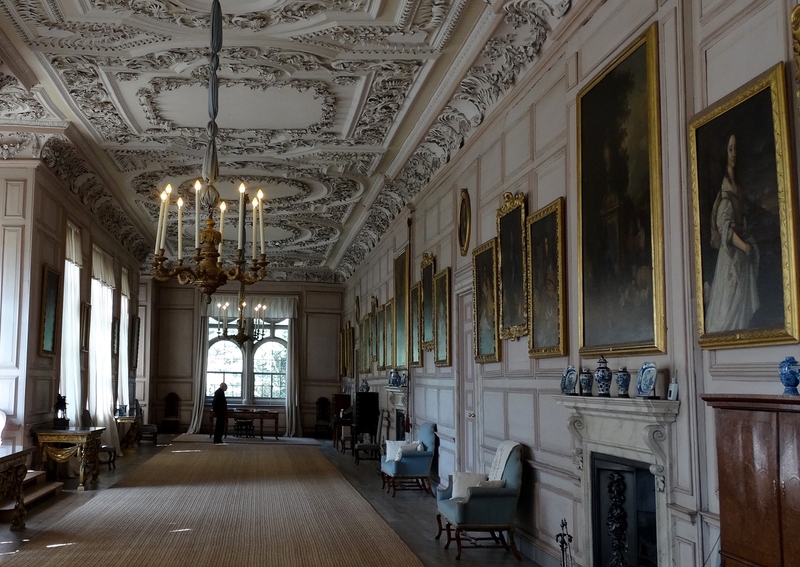 I recently visited the Grade I listed building of Sudbury Hall. This is where the internal shots of Pemberley were filmed for the 1995 BBC dramatization of Jane Austen’s Pride & Prejudice. 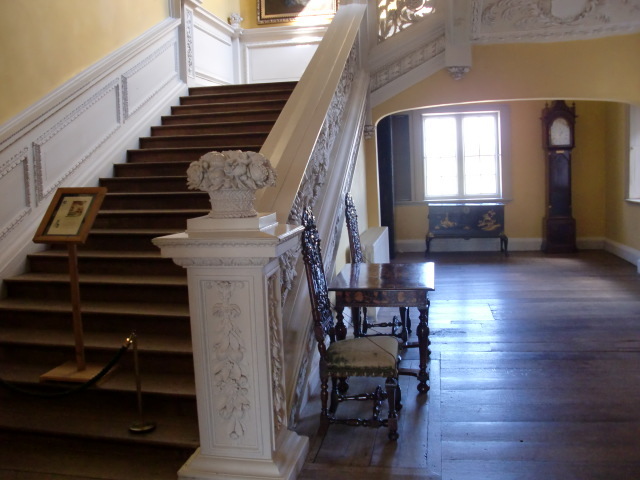 The house was built between 1660 and 1680 by George Vernon, and boasts a superb Great Staircase, fine Long Gallery, and elaborate plasterwork and carvings. To the rear there are formal gardens with a tree-fringed lake. The next two pictures are of when Elizabeth and the Gardiners are being shown around Pemberley by Mr Darcy’s housekeeper, Mrs Reynolds. As you can see, there is no longer access to the beautiful Grand Staircase, but I was still able to match a picture of them about to ascend it. Note the wonderful basket carving on the end of the balustrade rail. The conservators had to clean off centuries of paint and varnish to restore it back to its former glory. Well worth it too. The next room was where Mr Darcy writes Wickham his cheque. 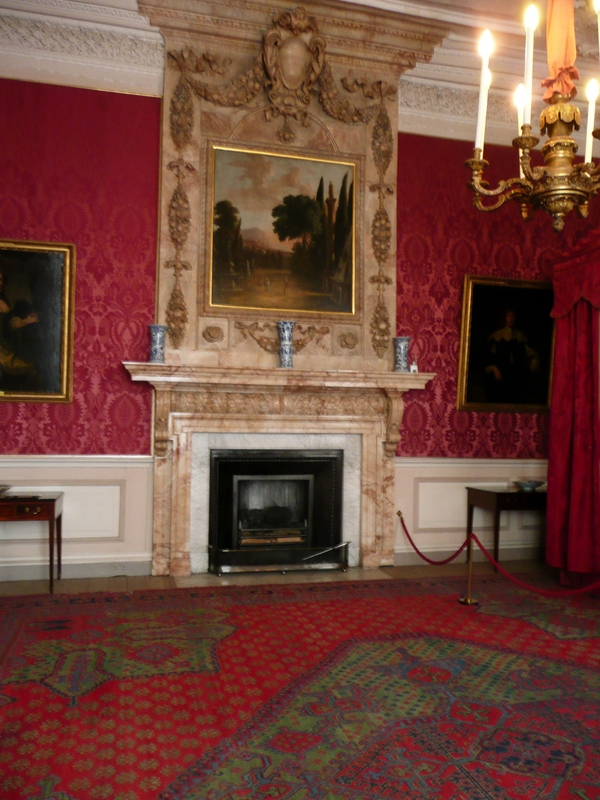 Mrs Reynolds also describes it as Mrs Darcy’s (Darcy’s mother) favourite room in the house. However, the desk used during filming is no longer there, and you are again have limited due to barriers. 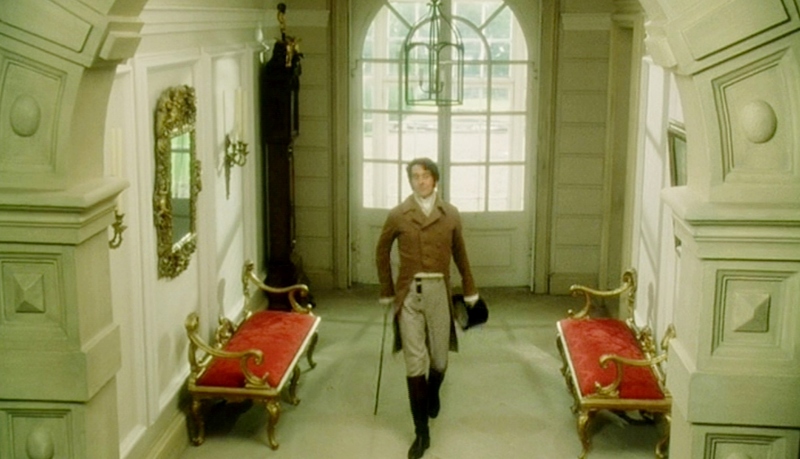 This room is where Caroline Bingley tells Mr Darcy how ill Miss Eliza looks. As you can see, there is no longer any furniture in it, but its outstanding feature, the fireplace, is worth a picture alone. Here we are in the Long Gallery, which is just over 138 feet in length. 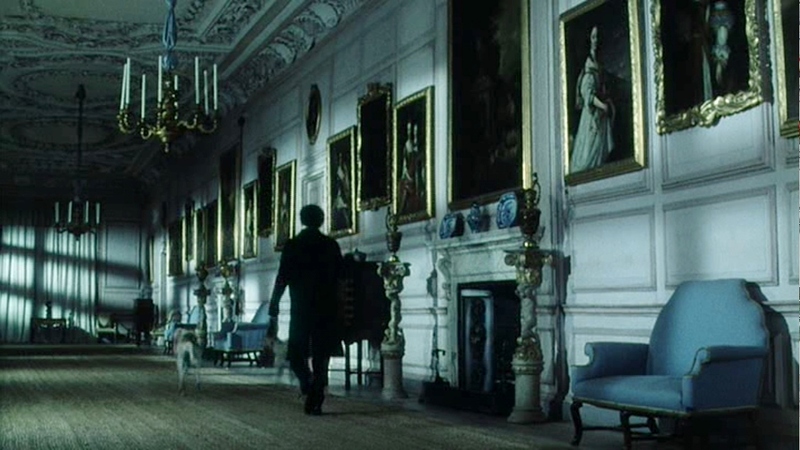 In this scene we see Elizabeth and the Gardiners, escorted by Mrs Reynolds, view the ‘finer, larger’ portrait of Mr Darcy in the Long Gallery. Elizabeth stands before the painting of Darcy, her admiration and budding feelings are clearly visible in her countenance, (I love using old fashioned words). We stay in the Long Gallery for the next set of pictures. This time it is where Mr Darcy walks through with his dogs after Elizabeth has left. He goes back to the salon and remembers the look they exchanged, when she hurried to Georgiana’s side after Caroline’s carless remark about George Wickham. Encouraged by her actions, and full of hope, he decides to propose to her the next morning. If you look to the right of the fire place you can see the same painting in both pictures. It is of Margaret Onley, who married George Vernon in 1660 aged 18. She died when she was only 33. 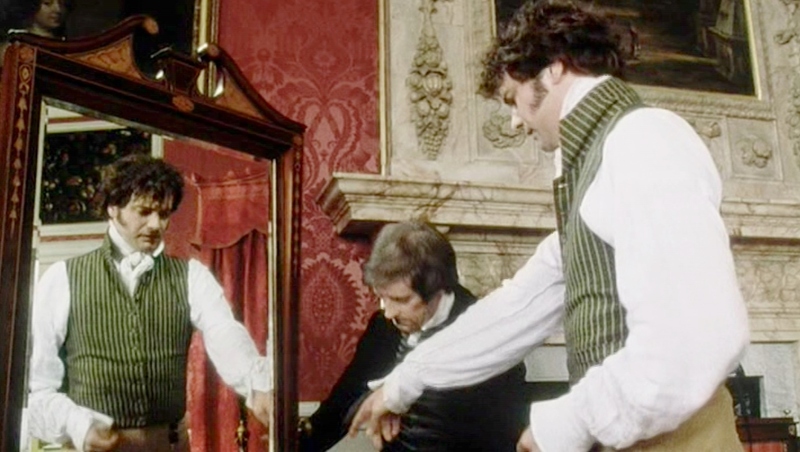 Next we see Mr Darcy getting dressed for that very important meeting with Elizabeth. You can clearly see the fire place mouldings and the distinctive red embossed wall paper. 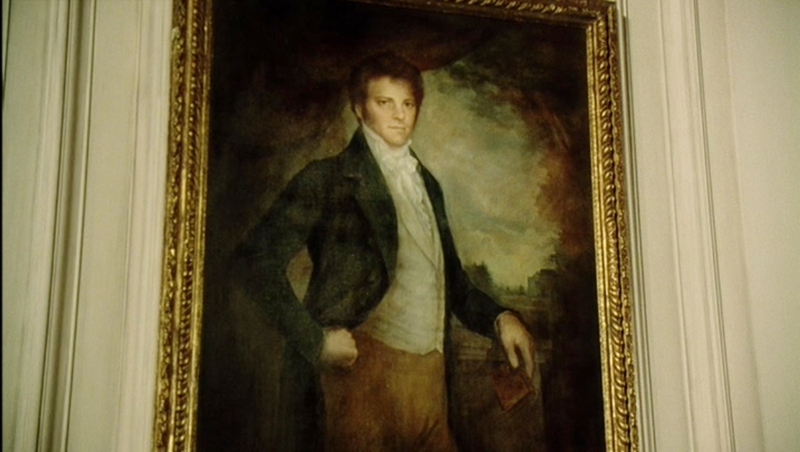 And finally, no post would be complete without that famous portrait of Darcy. Sudbury Hall is well worth a visit. 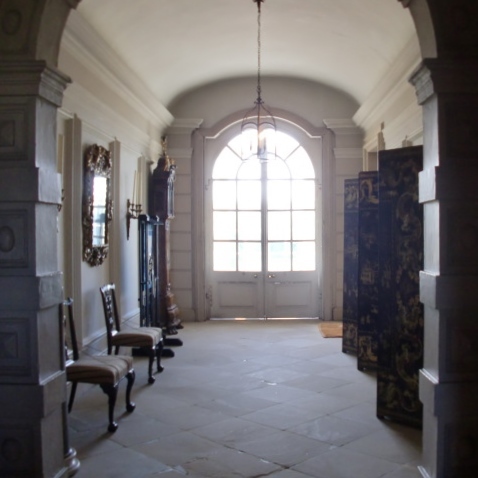 It has been restored beautifully and in many of the rooms you can walk around freely. We found the room attendants to be extremely knowledgeable and willing to share the house history and more unusual stories of the Hall. Please press the Follow Me button so you do not miss the next installment of, In the Footsteps of Pride & Prejudice. You are more than welcome. I know and appreciate how lucky I am to live in a country with so much of our heritage and building intact. Is this the face of a Teenage Jane Austen? Super excited to share my news. Mr Darcy’s Proposal has won Book Cover of The Year 2018. BLOGLOVIN Click here to follow me on Bloglovin. Follow all my new book releases here. Be added to my mailing list and get updates on all my new releases first. Austen Authors Blog dedicated to news & review about Jane Austen, her books and modern variations.